A: During the renewal period, one month before your expiration date, the Domain Name Request System will send you a reminder email with a direct link to your summary/confirmation page. Fill out any missing items noted on the summary/confirmation page with a red asterisk and the Renew Domain button at the bottom will become enabled. Click on the domain that is expiring. Complete any required fields. In this example below, the CIO contact information and CIO Approval Document are missing. As an example, the most common submission is a copy of a one-sentence email from the CIO saying “I am the CIO of xxxxxx and I approve of the domain name xxxxxx.ca.gov” with their name and contact info in the signature block. When all the required fields are filled out, the Renew Domain button will appear. Click the Renew button to complete your annual renewal. After clicking the Renew Domain button, you’re good to go for the year! 3. Q: How often do I have to upload a CIO or CIO Approval Document? Do I have to do this every year? A. Although the renewal process happens every year, you don’t have to upload the CIO or CIO Approval Document again if you already have one on-file. 4. Q: I administer multiple domains. Do they each need a unique CIO or CIO Approval Document? 5. Q: I checked and updated contacts less than a year ago. Why is it asking me to renew already? A: The required annual renewal happens at the same time each year. For most domains it is May – June. Your renewal date could differ depending on the date your domain was entered into the system, but it will be the same time each year. 6. Q: I worked here for years and never had to do this before. Why do I have to do the renewal? A: This is a new process. The system and the policy that mandates it (SAM 5195 and SIMM 40A) launched in May 2017, with the first renewal in mid-2018. It is important to know who to contact when something comes up. Previously, contacts on file could have retired for many years. The annual renewal process ensures contacts are relatively current, and any discrepancies discovered during annual renewal can be addressed quickly. Also, this is mandated by the federal government which ultimately owns everything under .gov. 7. Q: Is there anything I need to do if I already have a CA.gov domain registered with the Department of Technology (before the Domain Name Request System launch? As an example, a common submission is a copy or screenshot of a one-sentence email from the CIO saying “I am the CIO of xxxxxx and I approve of the domain name xxxxxx.ca.gov” with their name and contact info in the signature block. 8. Q: How do I request a new domain? 9. Q: What if my existing domain is not compliant with the Internet Domain Name Taxonomy nomenclature standards? You will be granted the new, compliant domain, but you are encouraged to phase out the existing non-compliant domain within one year from the date that your new domain is approved. 10. Q: Why doesn’t the Domain Name Request system not recognize my 4th level domain (xxxx.dmv.ca.gov)? A: The Domain Name Request system tracks only 3rd level domains (xxxx.ca.gov), which require approval and must follow nomenclature standards found in SIMM 40A. Once your 3rd level is approved, or grandfathered-in, you can add 4th level domains as long as your 3rd-level domain owner concurs. Since CDT approvals are not needed for your 4th level domain, any requests for technical work for 4th level domains should be directed to CDT’s Remedy System. 11. Q: I already work with CDT on technical requests for my domain via Remedy. Why is this system separate from CDT’s Remedy ticketing system? 12. 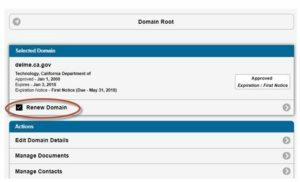 Q: I got my domain approved via the Domain Name Request system, now how do I request CDT technical services, e.g., associating my domain to an IP address, alias redirects, email account setups, etc., or report an incident related to my Domain Name(s)? 13. Q: What if my CA.gov domain is not currently hosted by CDT? A: Although all agencies/state entities are encouraged to have domains hosted by CDT, it is acceptable to have domains hosted elsewhere as long as they are in compliance with state and federal policies and guidelines. 14. Q: Is there a cost for CDT to host Agencies/state entities domain records?